Still in Örebro, at my hotel room after a hard day's work. Well, not that hard. Unless you count sitting a conference hall hard work. It's been long, anyway. 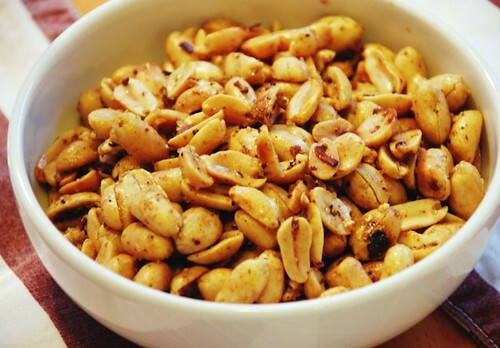 Photo - that's some very spicy and flavorful peanuts that I made a while ago. I'd been asked to test a few recipes for the Swedish food writer (and blogger) Lisa Förare Winbladh, and this is one of the things I tried. The spice mix is really nice, and rather close to the traditional chinese five-spice. I used, among other things, star anise, cinnamon, sechuan pepper (my first experience with this lovely spice! ), salt, chili pepper and some other things. I tried it with cashews too, but Per ate those so quickly I couldn't even get a photo. Highly recomended. I also helped Lisa with the recipies and I though the nuts were great!